But there is one real live example where human brains have been crushed by humble made-by-human computers. You may have already heard about “Jeopardy” game and many of you may have watched it as well? It is a real test of knowledge of an individual in varied areas. I am not going to talk much about the game, if you want to know more about the game, here are the details. 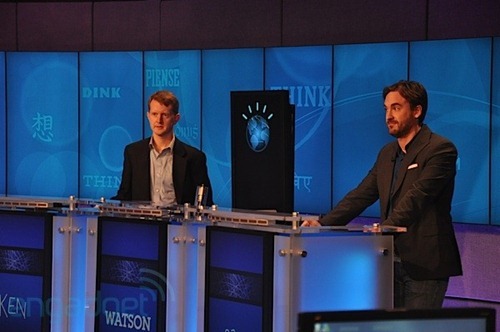 Now, coming to “machines vs humans” – A computer developed by IBM called “Watson” crushed two human champions in the man vs. machine showdown on the popular US television game show "Jeopardy!" If you think little deeper, Jeopardy as a game requires speed (first to press the buzzer gets to answer the question) and quick understanding of the question to get the correct answer. Just to give you an idea about how well IBM Watson played the game, here the Scorecard ! OK, let me be clear here – I am in the camp of people who think that machines long way from coming close to potential of human brain, but these kind of examples sure show us that Machines are developing fast as well. What do you think – Is it really possible to have Terminator, Transformers or Matrix like situations in future ? Machines DOES NOT ALWAYS NECCESSARILY win. 1) Either Viswanath Anand or Gary Kasparov (I dont remember exactly) won Chess against the greatest computer. The point is when we say machine we have to understand the level of its preparedness. Proof : I play chess with PC at starters level. I know all the mistakes the machine is going to make. So I win always. Machine at starters level is equivalent of your discription of humans using 2% of our analitical ability. Some times if we really focus, we can increase our use of brain power to may be 5%. Some real genious like Viswanath Anand can raise it to may be 80-90%. I pity my great great grand children. Poor kids !! They have to face so many difficulties. They have to face the mutated computers, they have to do with out cheap crude oil, they have to float above risen ocean levels.